Anyway, one thing that surprises me is that Starling seem very poor at addressing small bugs. After all, both of these are new banks and should be taking on the feedback people give them. I have raised two issues, and it seems to me that they are just ignoring them - not even "adding to the list", but basically saying they will do nothing. 1. When you get a payment (or even a DD) they do not show the other party sort-code and account number. Their response is that they "can't" show it. Which is odd. No more explanation and no indication that they will "fix" this. Why can't they show it? Clearly there is no technical issue - they see the data, but clearly there is no regulatory issue as other banks show this. Monzo show it with no problem, and other banks like Barclays will disclose it if you ask even if not shown on the statement. So it is not "secret" nor something they are not allowed to provide. It would be nice if "can't show it" was backed up with a tangible reason, but no. Nothing! 2. When you get a Direct Debit they don't show the reference. This is especially odd as the DD rules make us tell our customers the reference, but they don't then see it on the payment. All they see is the "base" part that was on the Direct Debit Instruction. For us that means customers not seeing the invoice number to which the the payment relates. Again, not explanation why - my message explaining this just got a message explaining that this is what they do - D'Uh, no attempt to address the issue at all, not explanation of why it is not shown. No suggesting they will even look in to it. 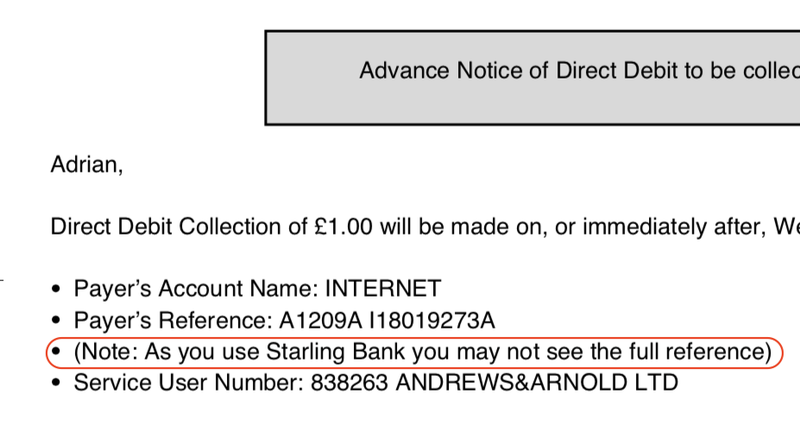 So, as of today, A&A DD notices for Starling Bank customers have an extra caveat to ensure our customers are not confused. I am happy to add the same if people find any other banks that are doing the same. The fintechs do seem a bit inconsistent. We've got Monzo that started well but has been adding more and more to their apps and it's all getting a bit of a mess (5 different UI styles just in the front line tabs on the android app). Starling have the slow and steady approach of the traditional bank.. but have also inherited the speed of a traditional bank & recently thought that the google rebrand of Android Pay to Google Pay was exciting enough to be launched as a 'new' starling feature. I think we're in the early adopter stage (I don't think either of these companies are close to profit yet?) so it'll be a year or two - possibly involving mergers and/or the VC money drying up - before the final form of either bank starts to become clear. Metro Bank are a mess too. They are supposedly a "challenger bank" and have "no stupid bank rules". All bunkum. They are just as slow, inflexible, outdated and disorganised as the major high street names. Metro Bank make some very specific claims that they did deliver on for me (opening a limited company bank account for me during a single walk-in visit to a branch, in less than 2 hours, including printing me a debit card which was operational straight away) but then once you're actually a customer and it gets down to the day to day it's the usual business of crappy telephone banking service, unreliable apps, pointless restrictions on transfers, etc etc etc. Our experience with them was poor. Multiple visits to branch, no same day account let alone same day cards, a business manager who wanted to skulk out the back, and people who agreed to timed appointments only to leave beforehand. My experience opening a community account with Metro was similar. Three visits to open the account, two more to get it mostly right and another required. Each time being given different information or instructions to the last person. And half the stuff has to be done in writing but also in person. Their idea of a new concept in banking seems to be to be as clueless and inefficient as the old banks. This is exactly my experience. Last year I signed up, and spent an hour trying to get a trivial script to talk to their API. Eventually it transpired they have CloudFlare configured to reject the UA of Perl's LWP - flat out, returns a 403 for any request. First I reached out to the on Twitter, almost immediate - and entirely false response - 'we're not blocking that, but talk to our developers on Slack'. Seems the role of their social media people is to respond promptly with anything that makes them look responsive, even if they have no idea what they're talking about. Months later nothing has changed, its hardly show stopping, but irritating they won't make a trivial change (or don't understand the security basics involved - I get the impression this is just a Cloud Flare default they've got set, and they think its making some sort of difference...). I just use the UA string 'HackStarlingBank/2.0' now and everything goes through 100% fine with that. MetroBank lured me in with a debit card that didn't load the exchange rate anywhere in the world, which was very useful. But it turned out to be the classic bait and switch technique because they then made it fee free only in Europe, so I ditched them. 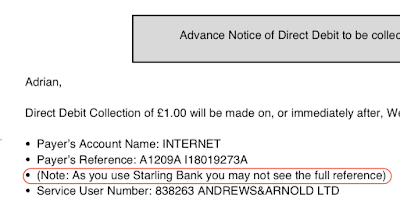 I can concur that Starling Bank are rather ignorant and arrogant. I spent months trying get information regarding how they keep the video selfies safe from hackers and safe from disgruntled employee abuse. I still haven’t gotten a straight answer. Atom Bank seemed decent and I like the biometrics, but I’ve given up on waiting for their current account. N26’s U.K. launch can’t come soon enough. If I tap on a direct debit in app I can see a reference, am I missing something ? How much of the reference do you see? I have tested and raised with their support, and see, in my case, just the A1209A but and not the I18019273A part. I'm not a customer of yours at the moment, the longest reference I can see is a paypal one which is 13 digits (it's the one they give you when direct debit is setup, not a transaction id). Not sure if in your case it's 2 references on the transaction or 1 reference with a space, if latter maybe they don't likes spaces ? As far as I recall the BACS formatted files that drive direct debit is supposed to be a fixed width format, so gaps would be filled with spaces. I wonder if someone in these banks has written a lazy parser which terminates when it first sees a space, rather than checking the entire string and trimming spaces from the right? I can't see anything except the AxxxxxA number either, with Nationwide. Wow, Proper banks show the actual reference. Interesting. I also bank with Nationwide and think there is a little confusion here. That screen shot is from the Direct Debit management screen, which allows it to be cancelled by the account holder, and not an individual payment. It does show the last payment details but that is incidental. The actual statements have never shown the DD reference details. Since the missing information is the invoice number this must change between payments and presumably wasn't provided when the mandate was set up: hence the management screen only showing the original mandate reference. Not being involved in payment processing I don't know if each payment is treated as an update to the mandate and should therefore always update the mandate reference number or if the reference is specific to a payment in which case it probably shouldn't. I've been pleased with Tide Bank. Not sure I’d want to use a bank that feels the need to have a “service status” page on its website. Which basically says that they intend to trawl through your financial data and use it to try to sell you stuff. No thank you. Sorry John - you'll soon find that all banks will be doing this. GDPR will probably cause them a lot of problems then. It would rely on consent which has to be "freely given" (i.e. not in return for having a free bank account) and "withdrawal at any time".